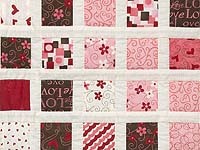 What a delightful quilt for that special person (of any age!). Note the care taken with piecing and even the cutting of the little block. 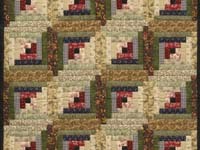 Great Country style fabric selections too. The top was made by the local Mennonite quilt designer Connie Lapp and it was quilted by her mother. Includes a sleeve for a hanging rod. 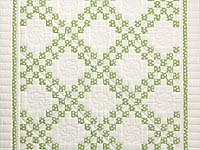 Fantastic coloring with an elegant take on a very traditional design. 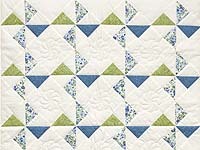 Note the precision of the piecing, the interesting quilting pattern and the especially lovely border fabric. 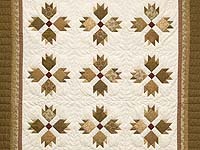 The quilt top was made by local quilt designer Connie Lapp and her mother did the quilting. 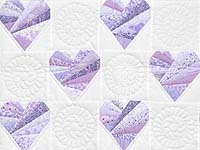 Sized so it can be used as a throw, wall hanging, or crib quilt. Exquisite! Outstanding 1920's style fabric selections with excellent piecing and fine quilting too.The quilt top was made by the local young Mennonite quilt designer Connie Lapp and the quilting was done by her mother. Includes a sleeve for a hanging rod. A classy take on a classic design! 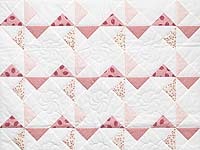 The combination of the uniform coloring and the precise patchwork piecing gives the quilt a very pristine look. 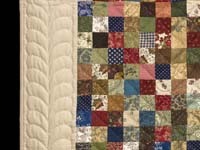 The quilt top was made by the young local Mennonite quilt Connie Lapp, was abundantly quilted by her mother. Includes a sleeve for a hanging rod. Delightful soft sweet coloring! 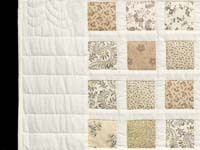 Note the care taken with the fabric selections and how the colors in each complement the others. 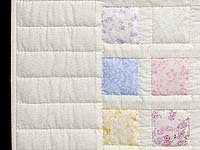 Excellent piecing and nicely quilted too.The quilt top was made by the local young Mennonite quilt designer Connie Lapp and the quilting was done by her mother.